Lights, camera, action! 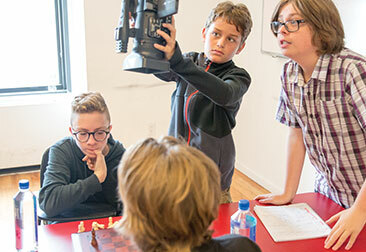 The New York Film Academy gives kids the chance to discover or hone their acting chops by getting real experience acting in front of the camera. Throughout their time at the summer acting for film camp, students will study fundamental acting techniques and practice them in front of their peers and the camera. By the end of camp, kids will gain a better understanding of the acting craft and the opportunity to showcase their own filmed monologues and scenes. Our summer acting camp for kids is led by professional actors in TV, film, and stage. These passionate professionals transfer their real-world expertise to the net generation of actors. During the two weeks, each camper will complete one filmed monologue and scene. 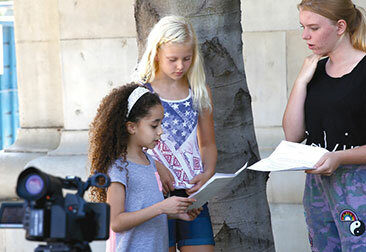 Our innovative acting classes encourage kids to develop the techniques and confidence they need to create believable performances for the camera. Campers apply what they learn to on-camera exercises designed to encourage their screen acting ability. At the end of camp, student work is celebrated with a screening open to friends and family, and students leave camp with a copy of their work. Building on the foundation of our acting for film camps, 2-Week Acting for Film II Camps investigate performing in a more in-depth production. Campers prepare two contrasting monologues and one complex scene, a challenge that further develops their acting skills as they explore new techniques. Classes are project-based, and kids learn to apply specific acting techniques and exercises to their monologues or scenes for the camera. Upon successful completion of each camp, students receive a copy of their work. Click here to learn more about the camp, the dates, and tuition information. Please note that dates, prices, and curriculum are subject to change.